I know, I know, Mexican again. I’m feeling overwhelmed by life this week, and when that happens inspiration goes out the window and I just want something comforting and familiar. These are comprised of the other half of a hunk of beef bottom round I bought over the weekend, marinated with lime, seared, and sliced paper thin, then topped with diced tomato, avocado, jack cheese, red cabbage, scallions and lime crema. I had some leftover Rancho Gordo pintos in the fridge, to which I added some of my pickled serranos for a little extra punch. Good enough for a Tuesday. Good enough for ANY time if you ask me. 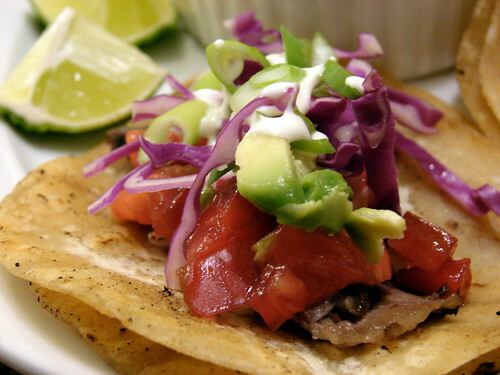 I love homemade tacos, mostly because you know where the meat you’re using comes from and what level of quality it is. 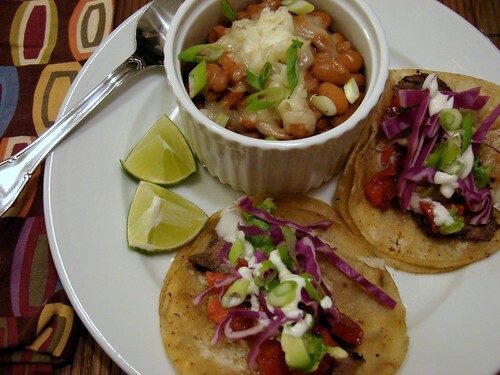 Mexican ingredients and flavors are a recipe for success any night of the week at my house. Yum. Oh goodness you know the way to my heart! I’m from Arizona and nothing, NOTHING speaks comfort food than Mexican food to me. You have inspired me to make carnitas tacos….There is a new technique I am dying to try and have made excuses because of the time it will take to get and make the product…but, now I feel inspired! Thank you! Oh yes…delicious, simple Mexican food. I had some last night also – marinated skirt steak w/ a little salsa and lime on the side. Good enough for any day — these look delicious! Your posts leave me montone-ish and garbling. I can feel my forehead getting lower and eyebrows bushier. Looks & sounds delicious!! When most people have a week like what you’re obviously experiencing, they turn to take-out or junk food but nooooo….not you…you feed your soul with comfort…I commend you!!! I hope that the rest of your week takes it easy on you! Mexican again? Oh, gosh — don’t apologise. It looks fantastic… the perfect antidote to a week gone awry! These look amazing! I could eat tacos every day. I’d like some right now.